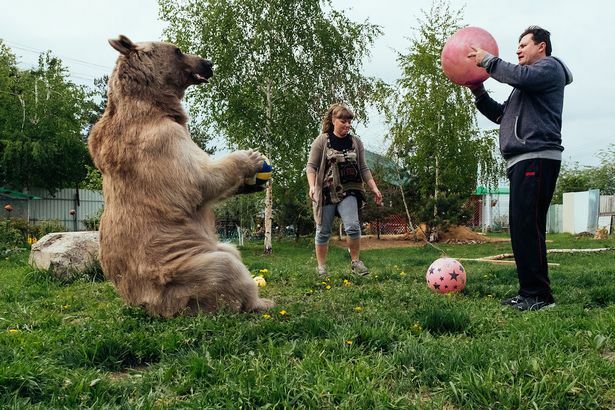 Stepan the bear who is 7ft tall and weighs 21 stone, but he’s fully domesticated thanks to Svetlana and Yuriy Panteleenko who adopted him at three-months-old. Stepan eats at the dinner table, watches TV with his parents and does his fair share of household chores. But he’s not your average relative – because he’s a BEAR. He’s so domesticated that he sits at the dinner table and waters the plants. Stepan gets through more than a bowl of porridge a day and also chows down on around 25kg of fish, vegetables and eggs. Stepan likes nothing more than to cuddle the parents on the sofa at night while they’re watching television. The couple adopted the bear when he was only three-months-old and had been found by hunters in the forest having lost his mother.